Welcome to, you’ve guessed it, another DC-area food blog. We would like to take the time to introduce you to Brett and Rachel’s venture into blogging together as we’ll be bringing you reviews on the newest restaurants, happenings around the area, and the latest news in the world of dining in our nation’s capital. As the title indicates, this website will cover places across the Washington metropolitan area, but that won’t exclude us from writing about venues that we encounter outside the DMV. And since we both live in Bethesda, we’ll give full disclosure that there will be a slight focus on the area due to the abundance of places to visit that are within steps of our home. Rachel also works where she lives, so she’s always on the move for a new lunch spot or happy hour get-together. So in short…much Maryland coverage, a good amount of DC reporting, and an honest effort to make it to Virginia a few times a year. We promise. At any rate, we hope you enjoy what we have to offer. 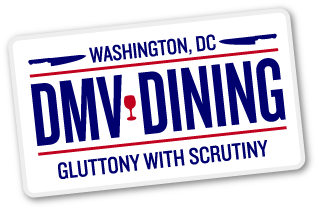 Be sure to follow us on Twitter @DMVdining, too. Thanks, and welcome to DMV Dining!